← The angry woman returns for a movements time…I love my trophy whore galore..
Summer of 1990 growing near parent’s home. Summer is a week away. It is a strange time of pulling, changing and growing. Gravity is intense now. Yet the tendency to expand to the cosmos is a real problem as well. This pulling down and expanding up is a type of living intensity that we all go through, but regardless we collectively enjoy our summer on this side of the earth; the western hemisphere. 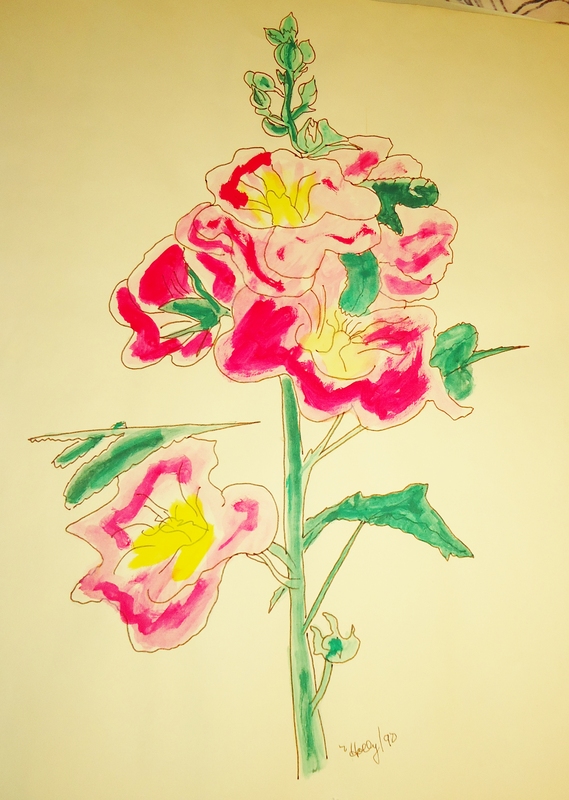 This hollyhock watercolor symbolizes what summer represents. The tall stalks and colorful blooms show the glory of summer. This hollyhock worked hard to get there too. I captured this the summer of 1990 when I too was changing and reaching a new phase of my life and ready for something new!! I found this image today while going through some of my things. I also found some sheet music by Hugo Wolf that I have been looking for such a long time. It was underneath hiding under the watercolor. I enrolled in an opera singing course at Los Angeles Valley College around 1996. I learned to love Hugo Wolf’s compositions and the variety of lyricists that he worked with. Bedeckt mich mit Blumen is a haunting and beautiful song. It was beyond my talents to sing but I still enjoy it completely. Bringing these two lost items, a watercolor and some music, is a way to celebrate the coming summer. I do not like summer much because leaving spring is a type of unwilling death to me…so the extramundane and oxymornic come together once more as gifts of days gone by for the coming summer. I die: love hath slain me. This entry was posted in "In the beginning there was a void except for the written word." The Avengers (Band) and tagged Alternative music, Art, beauty, Bedeckt mich mit Blumen, colorful blooms, Esoteric, Goddess and Home, Hudley Flipside, Hugo Wolf, Liederabend 15, Los Angeles Valley College, Oral Tradition, postaday, singing course, strange time, Subculture, Summer, Summer solstice greetings, Synchronicity, tall stalks, the written word, western hemisphere, Women. Bookmark the permalink.